The Israeli Defense Forces (IDF) confirmed Israel's spearheading the move at the request of the United States and European governments. The dead of night operation comes a week after reports first surfaced that serious discussions were held on the matter during the July 11-12 NATO summit in Brussels. The IDF official twitter account posted the following statement: "Following an Israeli Government directive and at the request of the United States and additional European countries, the IDF recently completed a humanitarian effort to rescue members of a Syrian civil organization and their families." The IDF further called the effort "an exceptional humanitarian gesture" and additionally confirmed that the White Helmets were transferred "through Israel". US officials including the State Department spokesperson have this summer made it a key talking point to warn of White Helmets being in "imminent danger" throughout Syria and face the threat of assassination especially in the country's southwest, as pro-government forces have now nearly completed their successful campaign to take back all of Daraa and Quneitra provinces. 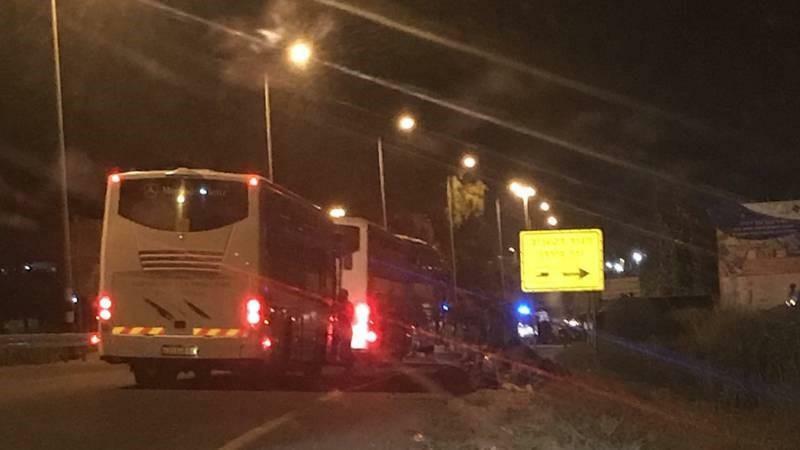 The transfer began at around 9:30pm local time with a large convoy of buses exiting a frontier area on the Golan Heights toward Israel. "Neither the AP report nor the Jordanian government statement mention Israel. This points to the fact that Israel’s role was considered controversial and that the method of the evacuation had to be kept under wraps until it was complete," according to the Jerusalem Post report. Meanwhile a number of journalists and analysts asked the obvious million dollar question: "Why evacuation specifically for just this group and its families?" Why not other civilians?" As we've detailed many times before both the West and the group's leadership have long claimed it's nothing but a humanitarian non-governmental organization (NGO) devoted to rescuing Syrians in the midst of war; however, far from being a "neutral" NGO the group has from its conception been funded by Western governments which have simultaneously sought the ouster of Syrian President Bashar al-Assad, while only operating in anti-Assad "rebel" territory, including still in al-Qaeda held Idlib. With today's Israeli rescue operation giving greater clarity to the nature of the group fundamentally being a foreign-created and foreign sponsored entity, a number of mainstream media outlets are now for the first time casually and belatedly referencing this fact. CBS for example writes, "The officials said the White Helmets, who have enjoyed backing from the United States and other Western nations for years, were likely to be targeted by Syrian forces as they retook control of the southwest." Early Sunday Britain's Foreign Office acknowledged in a statement that it and "international partners" had helped execute the planned evacuation. "White Helmets have been the target of attacks and, due to their high profile, we judged that, in these particular circumstances, the volunteers required immediate protection," reads the statement. The White Helmets organization was established in "late 2012 - early 2013" after a group of 20 Syrians were trained and organized by former British army officer James Le Mesurier. The group then received funding from Le Mesurier's Netherlands-based non-profit group, Mayday Rescue - which is in turn funded by grants from the Dutch, British, Danish and German governments. Though it appears the group is now non-existent in Syria's southwest after evacuation by Israel, they are still operational in other parts of Syria, including in Idlib in Syria's northwest corner bordering Turkey. The group has faced a constant barrage of criticism after being caught on film multiple times bearing arms alongside known al-Qaeda terrorists and even assisting in al-Qaeda conducted field executions — this as the group consistently referenced itself as a homegrown "first-responder" organization.